How will I be affected by dental implant surgery? Recovery times from Dental Implant surgery can vary depending upon the individual case, the number of teeth affected, the individual patient, and importantly, how you manage your recovery process. 99% of cases are treated under local anaesthetic in the dental surgery sometimes in combination with intravenous or oral sedation. 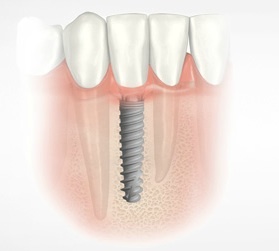 In the case of simple dental implant placement, with little or no grafting (for example to replace a single missing back tooth, or an immediate implant to replace a failing tooth) there is little or no post-operative discomfort or swelling. Patients will be able to continue life as normal with little inconvenience. A soft diet for a few days and careful brushing of the affected area may be all that is required. Typically in most cases after initial surgery to place implants, there is some minor swelling, mild discomfort and occasionally bruising that lasts for a few days. However this is well managed by medication and the post-operative management the dentist will prescribe. After approximately 7-10 days a patient can return to their normal diet routine. In some cases, patients may be advised to stick to a soft diet for up to 6 weeks post-procedure. If there is a need to carry out any bone or soft tissue grafting at the time of implant placement then the swelling is tends to be more pronounced.However, the dentist will advise the appropriate aftercare regime and medication to keep you comfortable. Is there anything that will negatively affect the implant healing? A patient’s recovery is hugely impacted upon by their lifestyle choices and tolerances. For example; If you are a smoker it is important that you minimise or preferably avoid smoking altogether for a week or so after any dental implant surgery. Smoking after surgery may increase the dental implant recovery time or cause potential harm to the healing process altogether, particularly if any grafting is involved. Dental implant recovery time and the healing process can be delayed or impaired from smoking, poor diet, excessive alcohol use and lack of dental care such as regular brushing. Maintaining oral hygiene and home care is essential to recovery and helps to ensure that no plaque or infection builds up around the gums. The dentist and hygienist will advise you of the best way to look after your implant(s). How long do I have to wait for the implant to take? Once the initial healing has taken place then implants will continue to integrate (bond or fuse) with the bone. In some cases the implants can be loaded immediately but more and typically loading (with a crown or bridgework) will be performed some 2-6 months after implant placement. This depends on the individual case, the quality of the patient’s bone and whether any grafting has been required. In addition, regular check-ups with your dentist will be required to ensure that the dental implants take in the best possible way. Any specific advice that affects recovery will be provided at this time.